Giving the audience an insight into the rocky life of Kenneth Grahame (Adam Venus) the author of much loved children’s book, “Wind in the Willows”, this production feels like an engrossing investigation into a man forgotten by most. His relationship with his son Alastair (Keith Jack) was not plain sailing and his extreme desperation for his child to succeed mixed with the infatuation he has with his new book ultimately costs him his family and puts him into a state of extreme ill health. 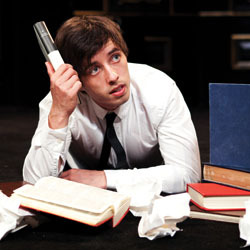 Jack’s portrayal of the young author’s son is exciting to watch with his energy constantly at a high level. The runner up in the BBC’s Any Dream Will Do has certainly come far since that first audition now enforcing a vocal ability that is second to none. The show is extremely slick, using a simple set of two treads and a roll on desk to create the necessary environments. The book themed scenography is ingenious and the costumes fit the period superbly. You just can’t help but feel the whole production just needs to be that little bit bigger in size and length to convey everything that is touched on in the script. Some of the themes brought up in songs never seem to be followed through and large chunks of time seem to disappear into thin air leaving the audience to piece the missing parts of the puzzle back together themselves. Alastair’s education is a fine example of this contradiction. One moment he is a ruthless rogue and an annoyance in class and the very next scene he has been offered a place to Oxford. Also the song Mrs Grahame sang about Kenneth’s wife Elspeth (Sarah Borges) could easily have turned the show in a whole different direction but evidently the scriptwriters and show creators missed a trick. Phillip Rowntree’s direction is well thought through and the choreography by Mandy Ellen is small scale but fitting. Ultimately Sincerely, Mr Toad is an emotional roller coaster put to song, that has all the potential to be a blockbuster musical. With just a little more thought and possibly a longer time slot this show is bound to go places. Sincerely, Mr Toad runs until 26th August at the Pleasance Queen Dome.